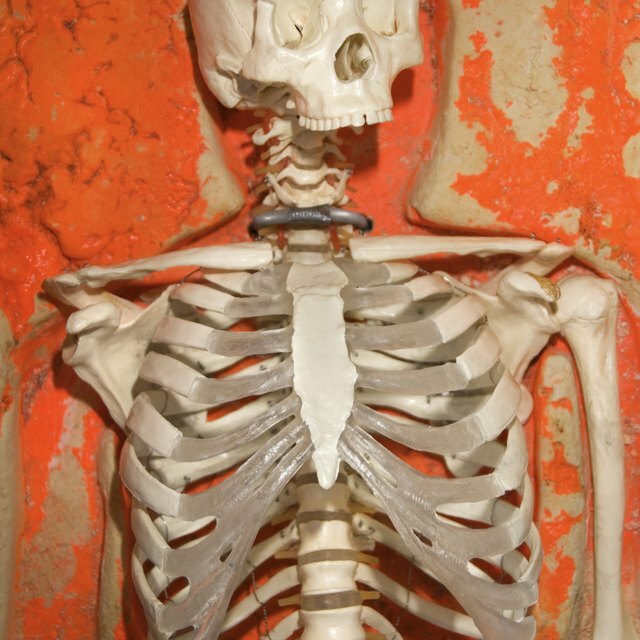 The human skeleton includes 206 bones. Over half of these, believe it or not, are in the hands and feet alone. Human bones range in size from the femur (thigh bone), which is the longest bone in the body, to the ossicles, the three tiny bones that make up the middle ear. The study of bones for its own sake is fascinating. You can use memory devices called mnemonics to learn the bones of the body – not all of them, perhaps, but groups of them, such as the eight individual bones of that form the wrist or the seven bones within the ankle. Bone is classified as a dense connective tissue. It is the major element of the skeletal system, which also includes cartilage, ligaments and tendons. The skeleton provides structural support, protects internal organs and allows for sophisticated forms of coordinated locomotion. Cartilage is also a firm connective tissue but is softer than bone, allowing for more flexibility of the skeleton as a whole were needed – for example, in the rib cage, which must be able to expand and contract with breathing and other movements. Ligaments connect bones to each other, whereas tendons connect muscles to bones. The marrow of bones is the site of hematopoesis, which literally means "blood making." In the marrow, both red blood cells, which transport oxygen from the lungs to the tissues, and white blood cells, which are needed to fight off infections and other invaders, are manufactured. The axial skeleton includes 80 of the 206 bones of the body. Although many of these bones are paired, not all of them are, unlike those in the appendicular skeleton, each of which is a member of a symmetrical twosome. The axial skeleton is so named because its bones all lie along or near the long axis of the body. These include the bones of the skull, neck, chest and back. The skull alone includes 28 bones – 11 pairs and 6 single bones. The torso's 52 bones include 12 pairs of ribs and 28 bones that are not paired. 24 of these are the vertebrae that make up the spinal column; seven of these are in the neck (cervical), 12 in the chest (thoracic) and five in the back (lumbar). The hyoid (under the chin), sternum (breast bone), and sacrum and coccyx (under the lower back) complete the axial skeleton. The appendicular skeleton gets its name from the fact that your appendages – that is, your arms and legs – are made of these 126 bones, organized into 63 pairs. 106 of these bones are those of the hands and feet. The other 10 pairs of bones include the scapula, which forms the shoulder; the clavicle (collar bone), which connects the upper limb to the thorax; the humerus, ulna and radius of the arm; the femur, tibia and fibula of the leg; the hip bone (consisting of fused ilium, ischium and pubis portions); and the patella (knee cap). Each hand and each foot includes 14 phalanges (the small bones of the fingers and toes) and five "meta-" bones (the bones of the hands and feet proper). The hand further contains eight wrist bones, while the foot consists of seven ankle bones. One way to study the skeleton is to come up with clever ways to recall whole groups of bones. For example, the wrist is made up of the scaphoid, lunate, triquetrum, pisiform, trapezium, trapezoid, capitate and hamate bones, in two rows of four. If you remember the first letters of these names using a saying like "Some Like To Play; These Types Can Hang," you can more easily recall the names of the bones themselves. What Are the 20 Major Bones in the Body? What Makes a Skeleton Move? Beck, Kevin. "How to Study the Bones in the Human Skeleton." Sciencing, https://sciencing.com/how-to-study-the-bones-in-the-human-skeleton-12753055.html. 19 November 2018.